You know that feeling when you um, have a feeling? As soon as I heard that this month's MeeBox was going to feature 'a UK indie brand that is inspired by history and magic' I was pretty sure there was only one company that could fit that description...Hands up who guessed the Splash MeeBox would be filled with A England goodies?! And that's not all! 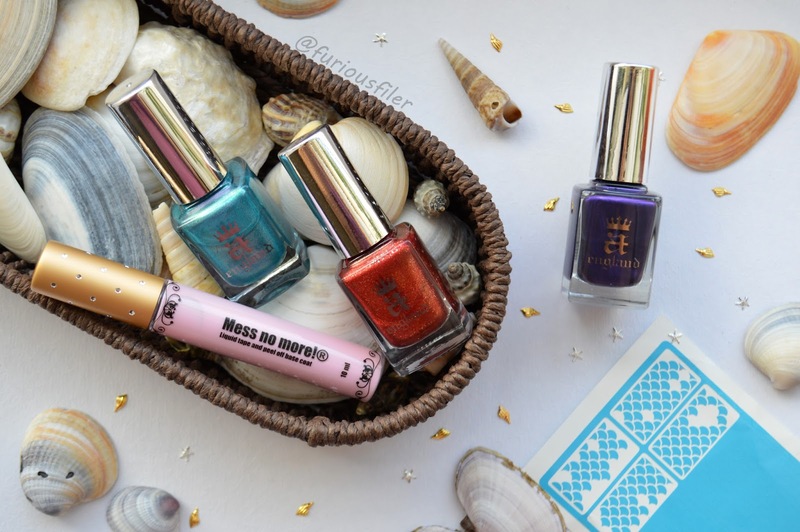 As this month's MeeBox was inspired by mermaids, there are a few more treats to go with the theme. Ah, aren't we lucky this month? Let's start with the swatches. I own a fair few A England polishes already and quite frankly, they are all fab. As you can imagine, based on my experience, I was expecting my new three shades to have the same amazing formula and unique colours. Check and check! A beautiful turquoise holo with a delicate purple reflection. I was trying to capture the colour change but my camera just wasn't cooperating. Here I'm wearing two coats for a flawless finish. 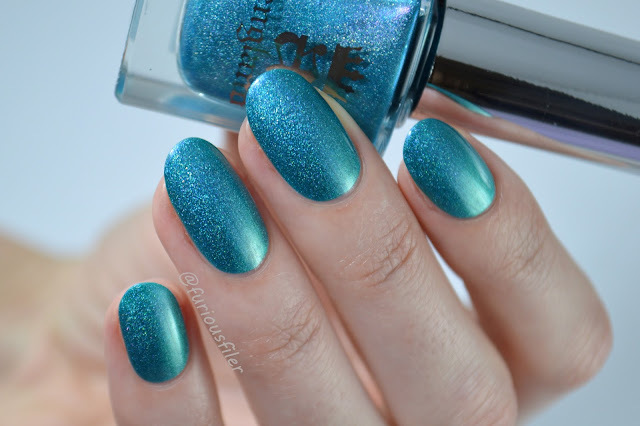 This colour makes me think of Ariel's hair! It's a rusty warm red with lots of gold flakies, and I mean, LOTS! It was opaque in one coat but I applied another one to see if it would make any difference. The flakies were definitely more visible and looked more 'layered'. 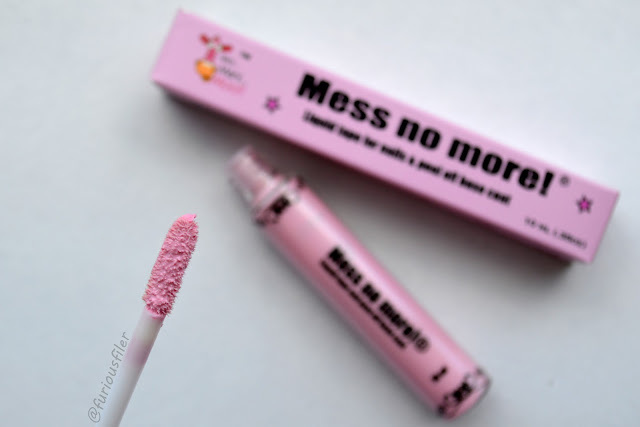 This is my favourite shade EVERRRR! What a surprise, it's purple! I am genuinely in awe of this polish. It's a one coater with a beautiful, almost satin like, liquid metal finish. It has a delicate sprinkle of blue shimmer but it's not really visible in the day light. Here I'm wearing two coats. This, I did not expect. The MeeBox girls only went and got us a liquid peel off tape to make our lives so much easier! For nail artists out there that means no more messy gradients or glitter application! It's very simple to use. You need to apply it around your nails, wait for it to dry, create your design and peel it off once you're done. I am used to a brush applicator but this one has a lipgloss like ending. It also smells like vanilla and masks the usual ammonia smell pretty well. And look at the pretty handle! I'm a sucker for pretty finishing touches like that! 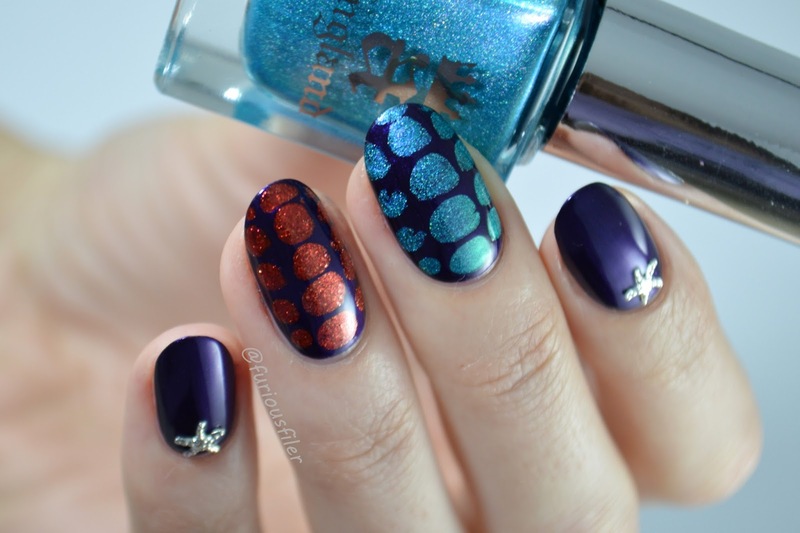 Studs are a perfect addition to any mani IMO, specially when they look as cute as these! I love the combination of purple polish and the silver starfish. The studs didn't stick out at the sides and fitted me perfectly. Well, that doesn't happen very often! I couldn't get the 'scales' theme out of my head so I decided to just go with it and added a blobbicure snake design. I have to say I'm not really confident with this technique so I'm quite proud of myself for producing something decent! I was a little apprehensive about using stencils as they never seem to work with my curved nails. 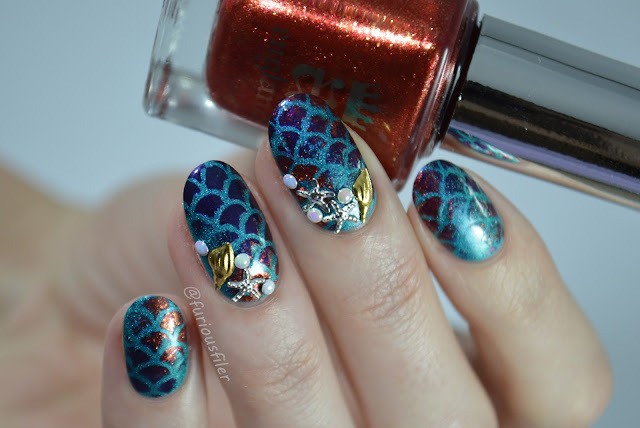 However I gave these mermaid scales stencils* a go and I must say I'm quite happy with the results. The sheet contained 16 full nail stencils which were a lot longer than my own nails. I was going for a 'scales shimmering in the light' kinda look as opposed to a solid outline. I started with a layer of Whispering Waves* and dabbed the other two polishes at random leaving a few empty patches. I then added a few shells and starfish. I couldn't help but add a few pearls of my own as I thought they'd go so well with the design! I felt like I was missing the sea element so I created one more design, that (I hope!) resembles sea waves. First the blobbicure and now drag marble, I don't know why I do this to myself?! When I think of my drag marble experience so far, I seem to remember wanting to cry and at the same time to punch someone really bad. I admit, it took me a few goes to get this design right but I'm pleased with the result! And that I didn't punch anyone in the end. Don't get me wrong, I am no Sveta Sanders but I'm slowly starting to get the hang of this technique. I am so impressed with the SPLASH MeeBox*. 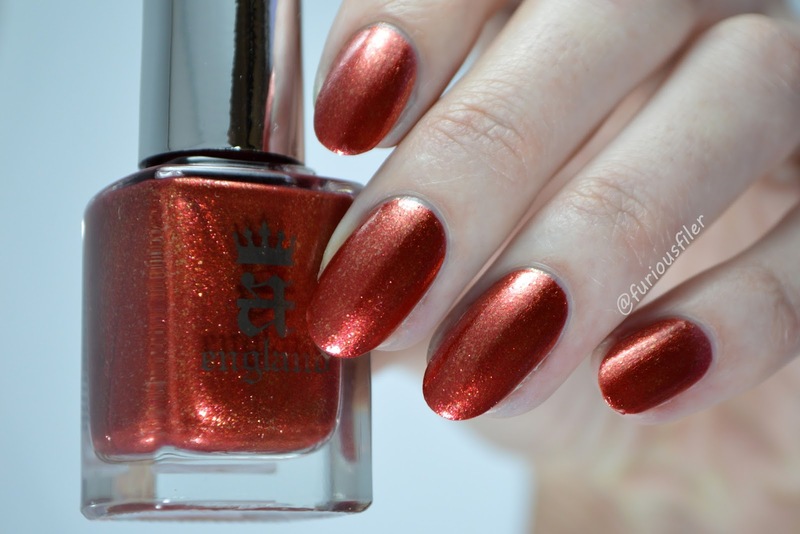 The goodies worked well with the theme and I can now add three more beautiful shades to my A England collection. What do you think about my designs? By the way, have you seen the theme for July?! Sign up to the MeeBox Newsletter to be in the loop! P.S. If you don't know who Sveta Sanders is, check out her Instagram page. MIND. BLOWN. Gorgeous manis. I got this box for myself as soon as I heard it was a UK indie and I hoped to God WW was in there lol was very very happy when I opened it. What a fab box, wish I'd got it. 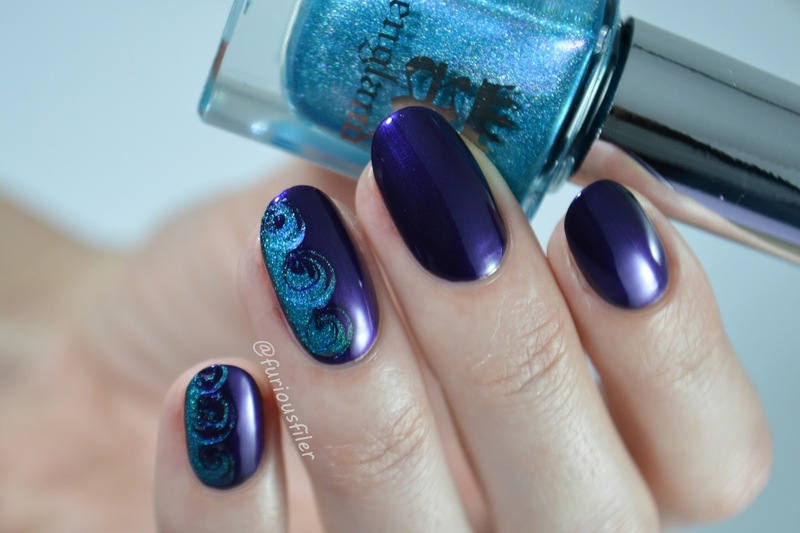 Love the mani's you created, especially the waves one it is stunning! I'm stunned by how perfect your nails, your mani's and pictures are, I bow to your nail blogging skills! I like all you works. Where you get your ideas from? I also do different designs ( I take them from http://nailartstyle.com/top-70-colorful-nail-designs ) and want to know more about other nail masters.